Cyclists in the City: Southwark Labour council sets out a strategy to shrink current growth in cycling, that also runs counter to Ken Livingstone's cycling policy. Southwark Labour council sets out a strategy to shrink current growth in cycling, that also runs counter to Ken Livingstone's cycling policy. Above: The roads in purple need stage 3 cycle training (ie more training than most driving licences) before you should cycle them, says Southwark. I'd argue some of them might need even more. 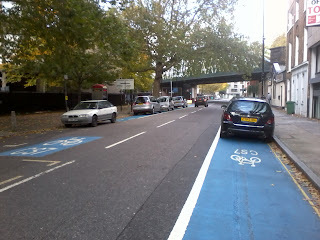 I posted at the weekend how Southwark councillors are looking to make the borough’s roads safer for people to cycle on. What I didn’t realise was that in doing so, I had stepped into a political rift between different political parties within the council. The Labour controlled council seems to be getting its cycling plans rather mixed up. And LibDem councillors are attacking the council (quite justifiably, in my view) for being 'anti-cyclist'. Earlier in the year, the local newspaper Southwark News commented that the Labour council has transport 'plans that will see cycle lanes in the borough removed'. The Labour leader of Southwark Council Peter John was in touch straight away after I posted about his cycling strategy at the weekend and has offered to meet and discuss his views. I look forward to meeting him. All the more so now that Ken Livingstone has come out and stated definitively that he believes there is space in London for proper bike infrastructure. He told the Guardian yesterday: "In some places you can put in separation. Most of our roads are wide enough to do that". Southwark now seems seriously out of step. Southwark recently published its investment plan for transport in the borough. There is a lot that is worthy in that plan. For example, it is admirable that Southwark is standing up to Boris Johnson’s number one road policy, which is to allow more car traffic to travel through London as quickly as possible. Southwark states that the Mayor’s policy may increase the share of motor vehicles on London’s roads and ‘therefore reduce cycling levels’. It proposes to challenge Johnson’s policy by ‘prioritising cycling’ when it designs street improvement schemes. Reading the detail of the Southwark plan, however, I was surprised that the council’s strategy targets a significant reduction in the growth rate of cycling. In 2006/7, cycling accounted for 2.9% of all journeys starting in Southwark and is expected to increase to 4.0% by 2013/4. For some odd reason, the plan is for that rate of growth to collapse after 2014 and to only shuffle towards a piffling 5% by 2025/6. In other words, the rate at which more people take up cycling is expected to slump in 2015 and continue to slump thereafter. This seems like a serious lack of vision from the council. What’s more, the Southwark plan suggests the council has significantly lower expectations than its northern neighbour, the City of London. The City authorities anticipate 10% of all people working in the Square Mile to bike to work by 2020. That compares with Southwark’s plan for only 5% of its residents to cycle by 2025. Furthermore, the City of London has committed very clearly to the creation of high-quality routes through the Square Mile where people will be given greater priority if they travel by bicycle. 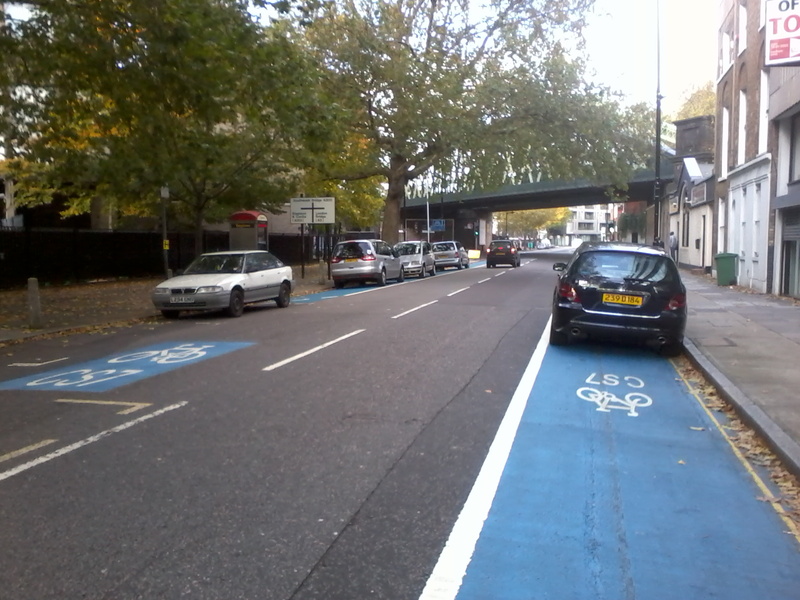 The Southwark plan is commendable for making clear that it intends to prioritise cycling. However, close reading of the Southwark investment plan is that ‘prioritisation’ will consist primarily of training and educational events. In other words, it neglects to commit the council to creating clear and meaningful routes where people are given greater priority if they travel by bicycle. Southwark believes that 47% of trips on its roads could be made by bicycle. I don’t believe that a commitment to education and a general statement about investment priorities is anywhere near enough to generate the conditions that would amount to 47% of trips being made by bicycle. To me the answer is very clear. I wouldn’t send my child out on Southwark’s roads and nor would most head teachers want me to (see this excellent post by Kennington People on Bikes for more on that). They feel too dangerous. Southwark has been true to its word and has published a map of all the roads in the borough according to what level of training you require to safely cycle them. You can look at the map here. What this map shows is that to get pretty much anywhere in Southwark, you need to be trained to bikeability level 3 (and personally, I would question some of these ratings. Some of these roads are considerably tougher than that.). In my view, this is like asking your kids to pass exams equivalent to the Advanced Institute of Motorists just to get to school. I'm exaggerating slightly but to make this point: Southwark is asking children and their parents to fling themselves around multiple-lane gyratories, to have confidence tackling right hand turns, often against four lanes of motor traffic. Southwark is also implying that, in order to cycle from one neighbourhood to the other, people must be trained to a significantly higher degree than to do the same journey by car. The fact is that Southwark’s pro-cycling rhetoric is completely and utterly undone by the facts on the ground. The council wants to encourage cycling. It believes 47% of all trips could be made by bicycle on its roads. It believes there would be huge benefits for its residents and business in the borough were that to happen. But it has very little on offer in order to make that a reality. I don’t believe that should be the case. Karl Cracken does an excellent job here of describing, very succinctly, the three basic essentials that might genuinely encourage people to opt for a bicycle trip instead of a car trip. He says that people need safe, convenient and direct routes. If their bike routes meet these three criteria, they will more likely cycle than drive. I don't see any of these three must-haves in the Southwark transport plan. It is a crying shame to see a council that has been, in the past a true leader in cycling, set itself on a trajectory that will do very little to encourage more people to cycling and that, I believe, will do equally little to bring down the borough’s poor record on cycling safety. Maybe they should consider doing a similar map for drivers? Would be interesting to see if there is a correlation between the required skill of drivers to tackle the same routes? Please note the Mark S above is not me (Mark Strong of Transport Initiatives). Intersting to note that pretty much my entire route from the office in Blackfriars to the LCC in Bermondsey St is along level 3 routes! Actually, I would say that as far as Union St, Newcomen St and Snowsfields are concerned that is a bit of an overstatement - they are not THAT bad - but the key for "Bike unfriendly routes" seems to be unused, but should apply to the junction of Southwark St and Borough High St, and ditto Long Lane/Tower Bridge Rd. Their attitude reflects one perhas curous fact about cyclists these days - you don't cycle because you are too poor to own a car, rather you cycle if you are affluent, hence the City haveing much hihger expectations than Southwark. What an upside-down situation! I cycle down Union Street/The Cut everyday and this map is nonsense as it's a very nice route, unlike Borough High Street which is horrible. If Southwark thinks it's a level three route it shows how little they understand what is required for comfortable cycling. I'd like to be able to go straight over Borough High Street at the end of Union Street , instead I'm forced to turn onto BHS and travel up a road that is effectively a chaotic dual carriageway. If Southwark understood the difference they'd find a way for cyclists to avoid BHS, instead they think these roads are all the same, so they feel they don't need to do anything. Union Street also has a bike lane on the pavement, presumably a bike lane is as dangerous as Borough High Street where people zoom along at 40mph.